While President Evo Morales was busy defending the rights of Mother Earth at the United Nations this week, Bolivia’s TIPNIS conflict escalated beyond the regional boundaries of Beni and Cochabamba into the national and international arena. While President Evo Morales was busy defending the rights of Mother Earth at the United Nations this week, Bolivia’s TIPNIS conflict escalated beyond the regional boundaries of Beni and Cochabamba (where the TIPNIS park is located) into the national and international arena. The lowlands indigenous marchers, now in day 40 of a 300+ mile trek from the Amazonian lowlands to La Paz to protest a proposed highway that will bifurcate their ancestral territory, are just outside Yucumo Police blockade near Yucumo confronts marchers. 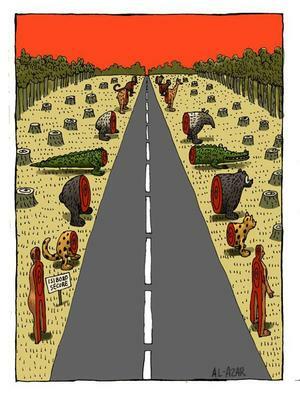 Credit: La Rázon.where several hundred MAS-affiliated “colonists” are blockading the road. The government has sent in 450 federal police for the stated purpose of avoiding a confrontation. Rather than guarantee the marchers’ safe passage, the police have prevented them from advancing and, according to news reports, have impeded their access to water, while the colonists have blocked delivery of other supplies. The colonists contend, and the government agrees, that some of the indigenous groups’ demands “violate their rights,” and should be dropped before the march is allowed to proceed. 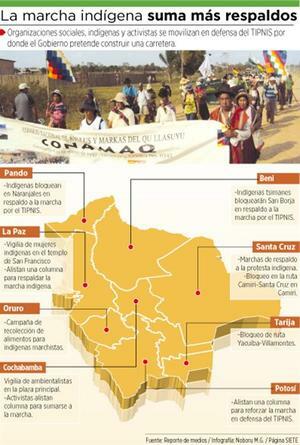 The TIPNIS marchers have gained significant support from other indigenous groups, workers, students, and civil society organizations throughout Bolivia. In a recent poll, 83% of those surveyed in Bolivia’s Credit: Página Siete. largest cities (Santa Cruz, La Paz, El Alto, and Cochabamba) said that Morales should negotiate directly with the protesters along the march route, which he has thus far refused to do. Close to 60% agreed that the TIPNIS road should be rerouted outside the park. 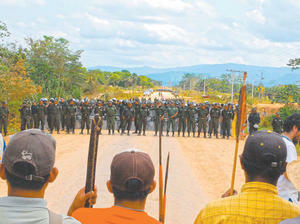 Supportive direct action by sectors in other departments intensified this week, with indigenous road blockades at strategic locations in Pando, Tarija, and Santa Cruz. These were quickly dispersed by police with tear gas and rubber bullets, in stark contrast to the policy at Yucumo. Close to a dozen protesters were wounded, but new blockades are emerging daily in other locations. In La Paz and Cochabamba, there have been continuous vigils, marches, and cultural activities to support the TIPNIS marchers. 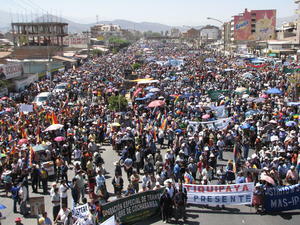 A caravan of 100 human rights activists, civil society leaders, and ex-MAS militants, including Alejandro Almaraz (former MAS vice-minister of land), Gustavo Guzmán (former MAS government ambassador to the U.S.), and Oscar Olivera (leader of the Cochabamba “Water Wars” in 2000), left La Paz for Yucumo early this week to stand in solidarity with the marchers. While road blockades to impede passage of the march have been threatened in other communities along the route, none have yet materialized. In Caranavi, just over the border from Beni in La Paz, colonist leaders this week denounced the Yucumo blockade and have been collecting food and water for the marchers. 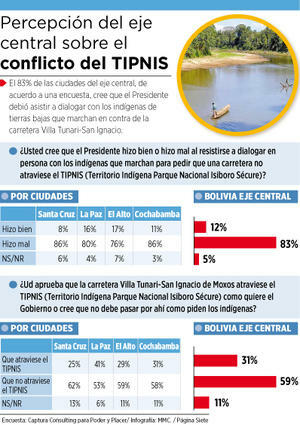 In the international arena, TIPNIS representatives have filed a formal claim with the United Nations, accusing the government of violating their rights by executing a contract for the construction of the highway before securing their “free, prior, and informed” consent, as required by international accords. A letter signed by 60 international human rights and civil society organizations (including NACLA) in support of the TIPNIS march was delivered to Morales at the UN. The UN representative in Bolivia has requested a suspension of all construction activity (currently underway on the sections of the road outside the TIPNIS) until an agreement is reached with indigenous groups. Regional actions supporting TIPNIS marchers. Credit: Página Siete.At least 6 social media sites (IsiboroSécure, TIPNISResiste, SomosSur, Fundación Tierra, CIDOB, and CEJIS) are providing up-to-date reporting on the TIPNIS conflict and related support activities for an international audience. Two popular groups on facebook are “TIPNIS en Resistencia” and “Amigos del TIPNIS,” with over 8,000 members combined. Another facebook site features a catalogue of TIPNIS posters by graphic designers from around the world. An international petition in support of the TIPNIS march sponsored by Avaaz has received more than 110,000 signatures (150,000 is the target). For those so inclined, it can be found here. For more, visit Emily Achtenberg's blog, Rebel Currents. Or see also, the January/February 2011 NACLA Report, "Golpistas! Coups and Democracy in the 21st Century;" the September/October 2010 NACLA Report, "After Recognition: Indigenous Peoples Confront Capitalism;" or the September/October 2009 NACLA Report, "Political Environments: Development, Dissent, and the New Extraction."